India-born Satya Nadella was on Tuesday named as the new CEO of 78 billion USD tech giant Microsoft and he attributed his leadership capabilities to playing cricket. 46-year-old Nadella, who takes over as the third CEO of the Redmond-based firm, is the first Indian to head the world’s largest software firm in its 38-year history, ending months of speculation as to who would succeed the retiring Steve Balmer. Nadella, along with Google’s Sundar Pichai, were the contenders for the top job. A cricket enthusiast, Hyderabad-born Nadella, who had joined Microsoft in 1992, previously served as the Executive Vice President of Cloud and Enterprise Group. “As Satya Nadella becomes the third CEO of Microsoft, he brings a relentless drive for innovation and a spirit of collaboration to this new role,” Microsoft said in a statement, announcing Nadella’s appointment. In an email to employees on first day as CEO, Nadella paraphrased a quote from Oscar Wilde–“We need to believe in the impossible and remove the improbable”. “We are the only ones who can harness who can harness power of software and deliver it through devices and services that truly empowers every individual and every organisation,” he said. Before joining Microsoft. 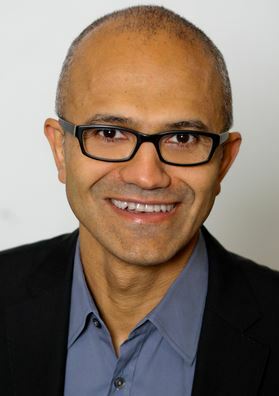 Nadella was a member of the technology staff at Sun Microsystems. Nadella attributed his rise to the top to cricket. “I think playing cricket taught me more about working in teams and leadership that has stayed with me throughout my career,” he said shortly after was named for the top post.